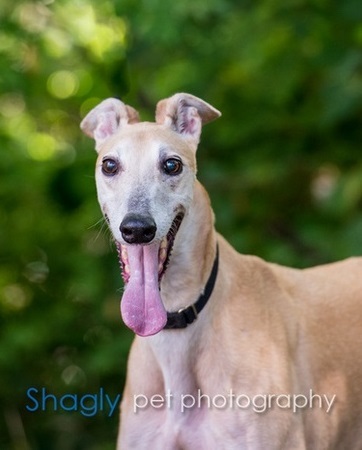 Slider was a proud and gentle grey. Slider looked after the family and especially Bubbles. He always made sure that the family was settling and in for the night before he would lie down and sleep. The children from the neighborhood would run to greet us on our walks to pet Slider. One of my favorite stories is the time Bubbles decided to go for a run and Slider after looking over his shoulder at me followed after Bubbles. I watched as the children ran after and watched as the smallest child of the group, no taller than Slider walked him back with her hand on his shoulder. Although we thought his running days were over, on a crisp cool morning Slider in his elegant style would run across the yard and then proudly stand on the patio surveying his domain. Slider would defer to Bubbles for meals and when entering or exiting the house. They never slept on the same bed until Bubbles was in her last days and he would lie next to her. Coming home from work the first thing I saw when walking to the door was Sliders head peering out from the bottom of the door window and then experiencing his excitement as we prepared for our evening walk. I will always think of Slider standing next to me as we watched those around us and know he is missed by all who knew him as he brought happiness.